Angelica genuflexa is found in North America from Alaska south to northern California, west of the Cascade range in the United States, and west of the Selkirk Mountains in British Columbia. This particular species is found west of Cascades below 2500’ft. Found in wet locations particularly bogs. It is a rare species in Washington, found more commonly in British Columbia. Kneeling Angelical is found in Boreal White and Black Spruce Forests. It is also found in both coastal and interior Western Hemlock and Douglas fir forests. This species may be collected as seeds. No other information available. Seeds need 3-6month stratification prior to planting. Seeds also require light in order to germinate. Seeds should be planted out immediately in order to stratify then germinate in the spring. Seeds can not be stored. The only information available currently is propagation from seed. Recommend installation be in the form of seeds planted out in the fall. This species requires moist to wet site. It is recommended that the seeds be planted out in the fall in an appropriate location. 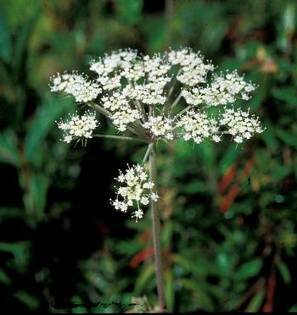 Kneeling Angelica is a perennial.